K-State baseball (17-18, 4-8) enters this weekend’s Big 12 series against No. 19 Texas Tech (23-14, 7-5) on a high having won three of its last four games, including a series win against then No. 3 TCU and a come-from-behind win in extras over Wichita State. The Wildcats and Red Raiders will play three games in Manhattan this weekend, with the first pitch of the series set for 3 p.m. today. While the recent results have been a stark contrast from the team’s earlier performances, K-State head coach Brad Hill said he insists that nothing has changed. Texas Tech, which started the season with lofty goals coming off an appearance in the 2014 College World Season, has been surging like the Wildcats. The Red Raiders enter the three-game series riding a four-game winning streak that extended this past weekend with a sweep of Baylor. 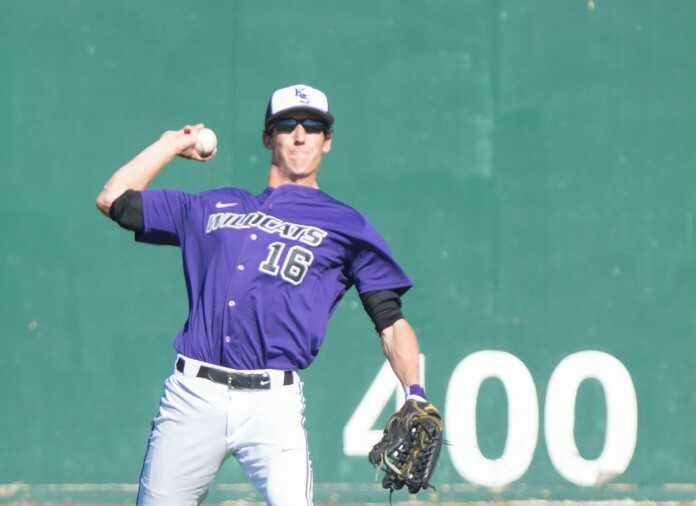 K-State’s series win over TCU earned the attention from the conference as senior outfielder Max Brown and junior infielder Tyler Wolfe were awarded with Player of the Week and Co-Newcomer of the Week conference honors Monday. Wolfe enters the weekend series with a .389 batting average versus Big 12 opponents and is tied for first in runs scored with 11 and third in on-base percentage with a .465 mark. The matchup against Texas Tech is the fifth-straight weekend that K-State has faced a ranked opponent, but rather than focus on that fact, the Wildcats say they’ve been taking things one step at a time. Kalmus (1-2, 3.70 ERA) will lead things off for K-State on Friday taking on the aforementioned Randy Moseley (3-3, 2.84 ERA). Last time out, Kalmus got a win over TCU after pitching a career-high 6 3/4 innings. Saturday’s game will feature Red Raider left hander Cameron Smith (4-2, 2.77 ERA) against a K-State starter yet to be announced. Both pitchers for Sunday’s matchup have also yet to be announced. First pitch for the series is slated for 3 p.m. at Tointon Family Stadium today after a move was made to accommodate bad weather that is expected to hit Manhattan starting tonight.